Astronomers have detected a repeating fast radio burst (FRB) – a mysterious, ultra-brief but extremely powerful burst of energy far away in space – for only the second time in history. FRBs were first discovered a decade ago, uber-energetic pulses of radio waves travelling through the Universe. They are brief, lasting just a few milliseconds, but carry more power than 500 million Suns. Researchers still don’t know what generates these bursts – some have even dubiously speculated that they could be aliens communicating with us. We have found dozens of such signals to date, but until now only one repeating signal was detected by the Arecibo Radio Telescope in Puerto Rico in 2012. 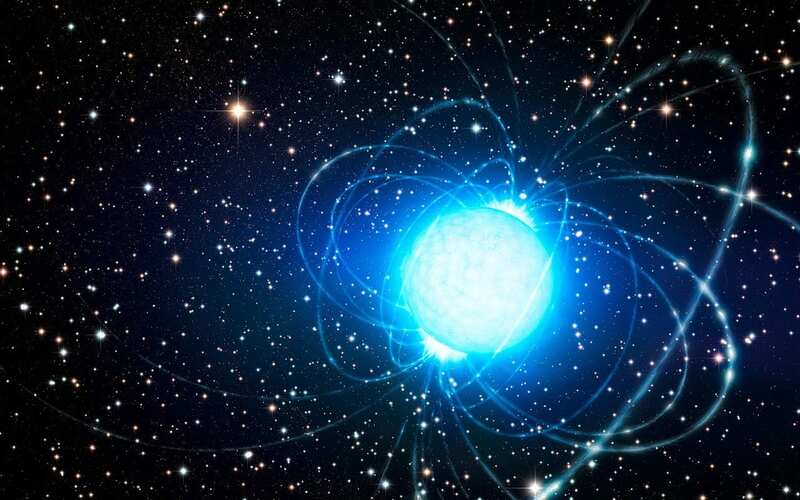 It’s thought that this first repeater’s origin may be a young, rapidly rotating and highly magnetised neutron star – extremely dense stellar objects thought to be the cores collapsed stars. But there are many different theories about the source of FRBs, including cosmic strings and evaporating black holes. Results published in the scientific journal Nature today could herald a fresh dawn in our understanding of FRBs. Scientists used a new telescope in British Columbia, Canada, called the Canadian Hydrogen Intensity Mapping Experiment (CHIME), to spot another 13 new signals including the second repeater. “There are still a lot of viable models [for their origin] out there, but if we can find even more FRBs, we can hope to narrow down that set in future,” says Ingrid Stairs from the University of British Columbia, part of the CHIME team. The main goal of CHIME, which began science operations in September 2018, is to probe the expansion of the Universe using its vast radio receivers. It works differently to the traditional radio telescopes with their large dishes, such as the Parkes telescope in Australia, the Lovell telescope in Jodrell Bank near Manchester or Green Bank telescope in the US. Unlike those telescopes, CHIME has so-called “light buckets” that collect very faint signals that arrive from space. Each of its stationary four large reflectors, curved like a half-pipe, collects radio waves from the whole sky as Earth rotates, giving a large scale map of cosmic radio waves. And CHIME has already proven extremely useful in searching for short-lived radio phenomena like FRBs, with potentially thousands more discoveries expected in the future. Most of the FRBs detected by CHIME were at lower frequencies than expected, down to 400 MHz. This is well within CHIME’s range, meaning the telescope – which was still only in a commissioning phase when it made these discoveries – could be expected to find lots more FRBs in the future. And then there is the second repeater. Repeating FRBs are important, because they tell us their source cannot be something that destroys itself – and we can pin down their origin. That’s how scientists knew that the first repeater lives in a faint dwarf galaxy more than three billion light-years away. What is also still unclear is whether repeating FRBs are produced in a different way to non-repeating ones – although these could perhaps also repeat if observed for long enough. Finding more FRBs will be crucial to narrowing down the answer, and thanks to CHIME we’re on the cusp of learning a great deal more.